This is displayed when the product does not detect any supported Source Control client software. The list of Source Control providers is displayed with the first provider selected by default. If you have more than one type of Source Control software installed, select the one you want to use, or clear the selected Installed Source Control providers option if you do not want to use the Source Control feature. Note: Source Control software is third-party software that is installed separately from Developer Studio . 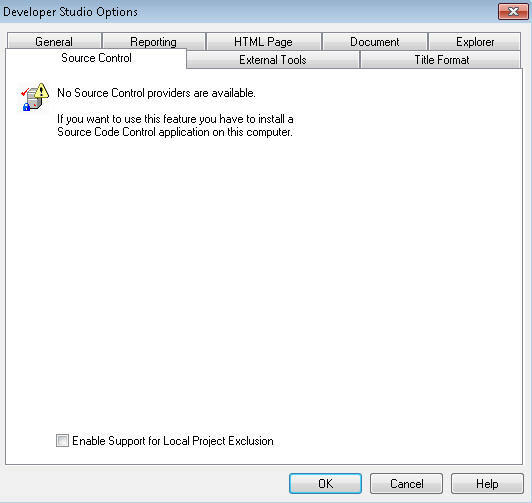 The Source Control software can be installed on the developers PC after Developer Studio is installed. When Source Control software is enabled, interface options are enabled in Developer Studio to allow developers to use the Source Control feature. This option is used by some source control systems and means that they require a staging area for their usage. When selected, it allows developers that do not want to use Source Control to exclude Projects that are added to Source Control. For more information, see How to Enable Support for Local Project Exclusion. This option is available from the Windows/Options… dialog box under the Source Control tab. It is applicable for local or remote Project development. When selected, it allows developers that do not want to use Source Control to exclude Projects that are added to Source Control. Select Options from the Window drop-down and select the Source Control tab. Select the Enable Support for Local Project Exclusion check box, as shown in the following image. Enabling support for local project exclusion makes the selected Projects behave as if they were not added to Source Control. The current developer can access files from this Project without getting source control prompts. For all other users that are working against the same environment and do not have this flag turned on for the specific Project, the Project will still show as Source Controlled.